On 15 August 1998, 29 people and unborn twins were killed in the Omagh bombing, the worst loss of life in a single incident during the Troubles. A further 200 people were injured by the 500lb (227kg) car bomb, which exploded in the town's high street on a busy Saturday afternoon. In the wake of the attack, the-then UK Prime Minister, Tony Blair, said the perpetrators would be "pursued to the utmost". But 10 years on, despite police inquiries on both sides of the Irish border at the cost of tens of millions of pounds, none of the bombers are in jail. Seven years after his award-winning programme Who Bombed Omagh? Panorama reporter John Ware returns to the subject in Omagh: What the Police Were Never Told. He has learnt that the UK's electronic intelligence agency, GCHQ, was recording mobile phone exchanges between the Omagh bombers on the day of attack as they drove the car bomb into the town. The claim, confirmed by Ray White, former assistant chief constable in charge of crime and special branch for the Police Service of Northern Ireland, raises new questions about whether the attack could have been prevented or the culprits brought to justice. As the programme reports, whether GCHQ could have helped stop the bombing comes down to whether they were listening to live exchanges between the bombers, allowing them to respond to events, or whether they were simply recording the conversations. Assistant Chief Constable White tells Panorama that the special branch officer responsible for requesting GCHQ's assistance is "adamant" he was expecting live monitoring. Assistant Chief Constable White says the officer had asked for this "primarily for the purpose of triggering a pre-arranged surveillance plan" to interdict the bombers. If intelligence officers were listening there were clues in the conversations, which though coded, could have acted as warnings. These include the key phrase "The bricks are in the wall", a code meaning that the bomb was parked and armed. That exact phrase had been recorded just two weeks earlier when bombers exploded a similar 500lb car bomb in the town of Banbridge. But, as Panorama reports, even if GCHQ could not have stopped the attack from actually happening, more could have been done to help the investigation which followed. Former Assistant Chief Constable White says that if GCHQ had shared telephone numbers and the identities of those using the mobiles immediately it would have meant that arrests could have been made in the "golden hours period" when forensic and other evidential opportunities were at their optimum. 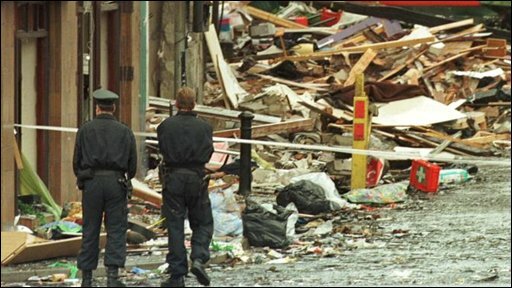 According to one of the sources who spoke to the programme, transcripts reporting exchanges with up to five mobiles associated with the bombers were sent to Belfast "within hours" of the bombing. But, as the programme reports, these were never disclosed to the detectives hunting the culprits. In fact, Sir Ronnie Flanagan, former chief constable of both the Police Service of Northern Ireland and the Royal Ulster Constabulary (RUC), told Panorama he was unaware GCHQ had been monitoring the bombers' mobile phones. Even when information was passed on it lacked the detail necessary to help detectives build their case. The fact that the bombers had used mobile phones, and that GCHQ had voice recordings and their telephone numbers, was withheld. Consequently detectives were forced to spend nine months trawling through 6.4 million telephone records to finally identify 22 suspects' phones active in Omagh and four other bombings. Although this proved which mobiles had been in Omagh, prosecutors needed evidence of who had been using them before going to court. 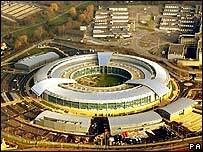 By law the GCHQ intercepts could not be admitted as evidence in court, but there was nothing to stop the details from being shared with the detectives to give them early leads. 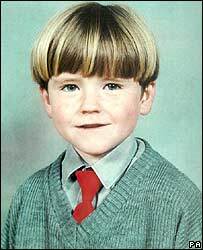 Panorama: Omagh - What the Police Were Never Told will be broadcast on BBC One at 8.30pm on Monday 15 September.